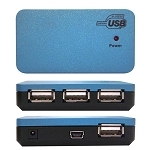 For a convenient and portable data connectivity device, take a look at the USB 2.0 7-port Self-powered hub. Designed with plug-and-play functions, enjoy the use of multiple high performance USB gadgets by simply plugging in. Compliant with the Universal Serial Bus Specifications, not only can this USB 2.0 power and data center function at high-speeds, but it can also detect and protect against over-current instances. 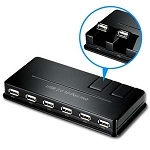 Featuring one upstream and several downstream ports, this 7-port USB hub has two ways to power up. 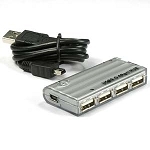 Use the upstream port to plug the data connection unit into a computer or notebook, or use the included power adapter for even more oomph! 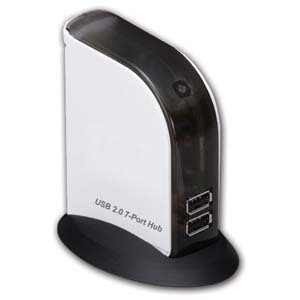 If you need to use multiple devices at once, or just like to have all kinds of multimedia available, then the USB 2.0 7-port Self-powered hub is the right product choice. For a connection diagram , click the "More Information" tab.